Landowners need pollinators. Plain and simple. But it’s no secret that pollinators are struggling while they lose their habitats. Honey bee hive loss now stands at about 40% a year. The bees we rely on to pollinate agricultural systems travel to blooming crops in the spring. After they pollinate those crops, most will replenish somewhere in the Midwest. By providing good nutrition, we can ensure an abundance of honey bees and alleviate their stress. The Eastern population of the monarch butterfly is also in serious decline. In just the last two decades monarch habitat's have been reduced by 80%. Without intervention and additional support, it has been predicted to have a 60% likelihood of extinction in the next 20 years. Thankfully there are people working hard to try and fix, or lessen, this problem! Peter Berthelsen has been working in wildlife conservation for over 30 years and believes, much like LandCAN, that landowners are the key to habitat conservation. With the help of his organization, The Bee & Butterfly Habitat Fund, landowners can not only improve their land, but preserve the delicate habitats of pollinators. The Bee & Butterfly Habitat Fund puts the best habitat where it makes the most sense; working lands. They believe there is room for conservation on every farm and ranch in the country. Acres that are not ideal for crops or grazing make great habitat opportunities. Now, more than ever, farmers need to make every acre count. The Bee & Butterfly Habitat Fund does that, with the potential for increasing net farm income if used properly and creating a successful, sustainable piece of land that’s responsibly managed. So how does it work? 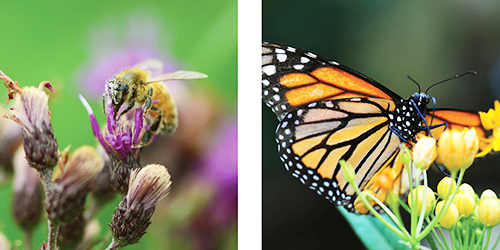 The Bee & Butterfly Habitat Fund works with private, public and corporate lands through the Seed A Legacy Program by providing free or discounted pollinator seed mixtures, as well as direction on how to prepare, and manage pollinator habitat for 5 or more years. Beginning as a pilot program in just 2 states in 2015 and 2016, The Bee & Butterfly Habitat Fund has expanded its impact by growing to 6 states in 2017 and now 11 states with the Seed A Legacy program in 2018. To date, we have established 225 projects on 2,560 acres of habitat. There is a waiting list for participants! Participants agree to maintain and manage the habitat project for 5 years. Applications will be ranked using key criteria to ensure the best projects are selected. Haying and grazing will be permitted except during April 1 to September 30 of each year. Habitat establishment, site preparation, and management guidelines will be provided to participants.